Seen at the western terminus of route 6, at the Črnomerec interchange, where many passengers transfer to/from bus services. 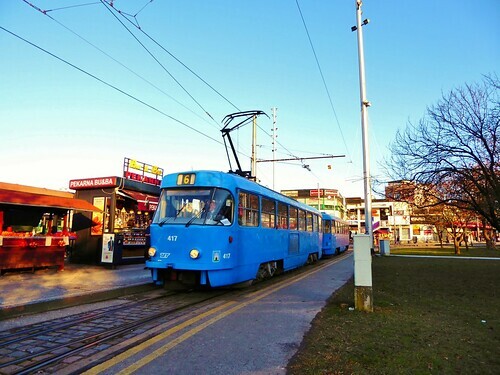 The second-most common tram type (after the modern TMK2200 types) is the T4YU type manufactured by ČKD-Tatra, of which there are 95 units in Zagreb (with matching B4YU trailers). These entered service between 1977 and 1983, so it is quite astonishing to still see them in service.